UPDATE: The Bill described below was not debated due to an over-packed Parliamentary agenda and lack of time. Alison Thewliss MP has instead announced an inquiry into Infant Feeding Services. Baby Milk Action will submit evidence from our monitoring and other expertise to this. Please do contact you MP to explain why better marketing regulations are necessary, if you have not done so already. Members of Parliament in the UK will be discussing the marketing of baby milks, feeding bottles and teats on Friday 24 March 2017. This is in the context of a Bill tabled by Alison Thewliss MP, the Chair of the All Party Parliamentary Group on Infant Feeding and Inequalities. Find information here about contacting your MP to support better marketing regulations. The Feeding Products for Babies and Children (Advertising and Promotion) Bill passed its first reading on 16 November 2016 (when it was agreed to draft the law). The draft text will now be discussed in the second reading and, if passed, will go to Committee stage for line by line scrutiny before returning to Parliament for the third reading to approve it to go to the House of Lords for debate and approval there. See the introduction to our Look What They’re Doing monitoring report for details of where current UK law falls short of international minimum standards. It is unusual for Private Member’s Bills to complete this process as the Government has to schedule enough time. However, it may do so, and otherwise provisions may be included in other legislation and it provides an opportunity to raise the need for legislation. 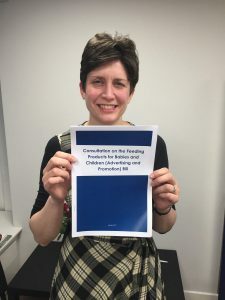 Alison Thewliss conducted a consultation prior to drafting the Bill and published the results on her website. The summary of findings from the majority of respondents (not including the baby food industry, which opposes the Bill) is very much in line with the International Code of Marketing of Breastmilk Substitutes and subsequent, relevant Resolutions of the World Health Assembly. Baby Milk Action works for Code and Resolutions to be fully implemented in the UK. We also monitor the baby food industry with the help of supporters across the country. This evidence demonstrates that better regulations are needed for milks marketed for feeding babies below 36 months of age (Infant formula, follow on formula and other baby milks) and feeding bottles, teats and other products used with them. • Independent information on these milks from NHS Choices and other experts is being contradicted by company marketing messages and product labels. CLICK HERE FOR DETAILS. • Unnecessary products are being marketed for different age groups of babies and for supposed feeding problems using misleading health claims. • The current UK regulations do not cover milks for babies over one year of age, feeding bottles and teats, and new marketing channels (such as smartphone apps. and social media) are not adequately addressed. • Fortified milks can undermine good nutrition in young children since they are almost universally higher in sugar than a plain animal milk or unsweetened milk alternative. Higher-calorie, energy-dense milk products are likely to contribute to overweight and obesity in children. • Health workers are encouraged to endorse products. They are offered sponsorship, training and other benefits by companies. Baby Milk Action will be releasing a new monitoring report shortly. Supporters may wish to contact their MPs in advance of the debate. It is best to prepare your own message for MPs. You may wish to support specific calls made in the consultation report published by Alison Thewliss MP, as summarised below. The vast majority of respondents indicated support for the broad aims of the Bill. The British Specialist Nutrition Association – which represents Abbott, Danone Nutrica Early Life Nutrition, Mead Johnson, NANNYcare and Nestle – is opposed to the Bill. I have been targeted with bottle and formula adverts since my baby turned 6 Months. I breastfeed and will be until he self weans. I think any milk substitute advertising should be banned. If a baby requires a breastmilk substitute the mother is capable of finding one without advertising. All other mothers do not need to be targeted anyway.